SpaceShipOne, the rocket plane aiming to win the $10m Ansari X-Prize, has completed the first of two qualifying flights above the Californian desert. The vehicle blasted straight up over Mojave Airport but started to roll. 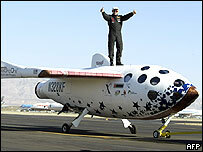 Experienced pilot Mike Melvill shut the engine down early and regained control to bring SpaceShipOne safely back down. The SpaceShipOne team confirmed that the craft had reached 103km (64 miles), passing the 100km boundary of space required under the prize rules. Official verification was expected from the X-Prize judges, but data from Edwards Air Force Base also showed that the craft had passed the 100km mark. The Ansari X-Prize was set up to galvanise the commercial spaceflight business. It is hoped the competition will eventually kick-start a new age of space tourism with ordinary people buying tickets to go on short, sub-orbital hops. Leaving the craft, Mr Melvill told the relieved crowd that the flight had been "fun" and that he felt he had really "nailed it". Downplaying the dramatic flight, he said the craft had surprised him with its "little victory roll", and he had shut down the engines 11 seconds prematurely as a result. 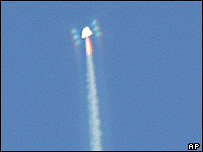 The craft rolled several times as it travelled nearly three times the speed of sound. "Did I plan the roll? I'd like to say I did but I didn't," Mr Melvill explained. "You're extremely busy at that point. Probably I stepped on something too quickly and caused the roll but it's nice to do a roll at the top of the climb." He also revealed that Burt Rutan, the aviation pioneer who designed the craft and who leads the SpaceShipOne team, had asked him to shut down the engine earlier. But Mr Melvill had held on until he knew the craft would reach the required altitude for the X-Prize. To claim the prize, SpaceShipOne must now repeat the flight within two weeks. A second launch has been scheduled for next Monday, 4 October. 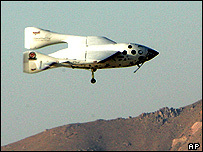 SpaceShipOne became the first private, manned craft to go above 100km in a June test flight. Both SpaceShipOne and the White Knight plane which ferries it to its launch altitude were designed by Mr Rutan and backed by Microsoft co-founder Paul Allen. Both men welcomed Mr Melvill as he emerged from the rocket plane after the 81-minute flight. Mr Rutan said that until the team had analysed flight data, he would not know whether the unexpected roll would delay Monday's attempt. A decision is expected this week. "They made the altitude," he said. But speaking of the corkscrew ascent, he added: "I was worried about that because that's not the way it was supposed to be." Mr Rutan said the spin did not come as a complete surprise though. Similar rolling had happened during flight simulations. June's record-breaking test flight had also experienced a rolling problem. Some "anomalies" had occurred with the craft which had led Mr Rutan's team to make minor technical alterations to the vehicle. The X-Prize is for sub-orbital flights - short journeys in which weightlessness is experienced for just a few minutes as the craft falls back to Earth. Already, one millionaire is looking to the future by offering a $50m reward for the first private orbiting spacecraft. This would allow for much longer trips into space lasting hours and perhaps even days. On Monday this week, the British entrepreneur Sir Richard Branson said he would be offering commercial spaceflights in about three years using Mr Rutan's SpaceShipOne technology. Sir Richard's Virgin Galactic SpaceShips should be able to carry five passengers above 100km. A rival X-Prize team, the Toronto-based GoldenPalace.com Space Program, which was formerly called the daVinci project, has put back its stab at the prize. The team had been scheduled for a first launch on 2 October. Team leader Brian Feeney said the delay was necessary to allow more time to work with a pressure vessel for the Wild Fire spacecraft, as well a few other minor components.